UNITED STATES: Surveyors Fugro will investigate two potential large-scale offshore wind sites for Ørsted (formerly Dong Energy) off the coasts of New Jersey and Massachusetts. The geo-intelligence company was awarded the contracts to undertake geotechnical studies at the Bay State Wind site, 15 miles from Martha’s Vineyard, Massachusetts, and at the Ocean Wind site, 10 miles off the coast of Atlantic City. 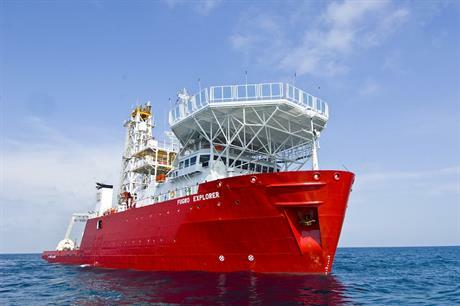 Fugro will dispatch its Exporer vessel as it carries out sampling and in-situ testing at the two sites, it stated. The investigations are due to start imminently and will last about three months. Prior to the contract awards, Fugro carried out geo-consulting desktop studies and geotechnical ground truthing for Ørsted, the company added. Ed Saade, president of Fugro USA, said the two contracts provide the company with an opportunity to build on the relationship it has with Ørsted in Europe. Last year, Fugro carried out pre-construction surveys at the 659MW Walney Extension site - half of which Ørsted has since divested. Saade added: "We strongly support the growing offshore wind development activity here in the US." Coastal states in the northeast US, such as New Jersey and Massachusetts, were found to be ‘well-positioned’ for offshore wind development, a series of reports concluded last month. But to date, the US has just the one operating offshore project – the five-turbine, 30MW Block Island wind farm off the coast of Rhode Island. Bay State Wind and Ocean Wind are among a handful of proposed offshore US sites. They are both expected to have a capacity of up to 1GW.